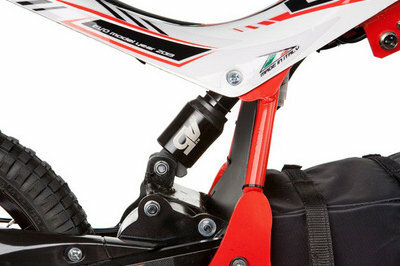 • Rugged chassis and swingarm: Weight is important in a youth trial bike. Both the frame and the swingarm are constructed of aluminum with a hardness heat treatment, achieving a robust bike that does not exceed 24 kg (53 lbs). 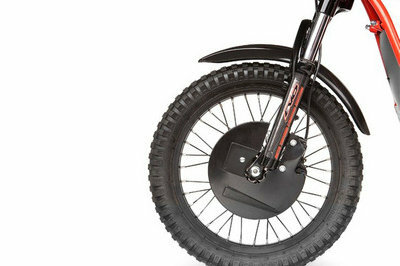 Another very important feature is the weight distribution, it is designed with an optimized center of gravity for a comfortable ride while providing maximum traction. 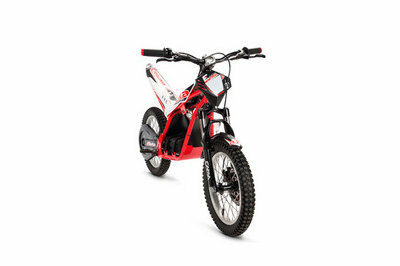 • Programmable digital switchboard: As a result of experience in the evolution of the electronic components in the trial bike, the Minitrial-E has a programmable digital control with 3 power curves. All of them with an initial soft engagement to eliminate the abrupt "on / off" characteristic of electric motors. The first setting, a learning curve for the new rider, the second setting is for wet conditions or for continued learning and the third setting is for the more advanced rider. • Adjustable Suspension: The front fork with 25 mm tubes, adjustable compression spring in oil bath with an air shock for the rear suspension. • Shimano Hydraulic Brakes: Provide perfect braking, a mark of quality and reliability for the younger rider. • Guards: The front brake as well as for the drive chain are enclosed to insure safety. • Chain Guide: Essential for off road, this unique chain guide insures a proper guide for the chain to reduce failures.